Closely examining the Darfur, Sudan, genocide, and making reference to other genocides, this Article argues that the genocide prevention strategies which are currently favored by the United Nations are ineffective. This Article details the failures of targeted sanctions, United Nations peacekeepers, and other antigenocide programs. 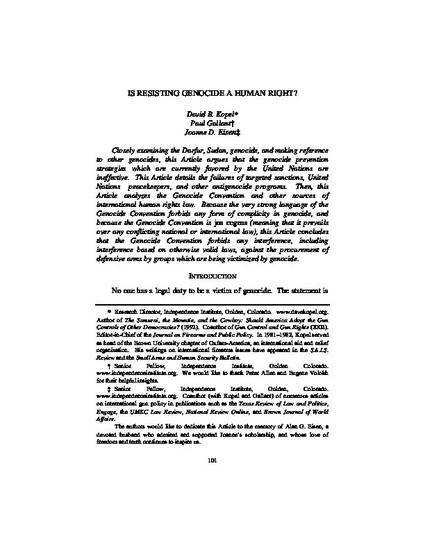 Then, this Article analyzes the Genocide Convention and other sources of international human rights law. Because the very strong language of the Genocide Convention forbids any form of complicity in genocide, and because the Genocide Convention is jus cogens (meaning that it prevails over any conflicting national or international law), this Article concludes that the Genocide Convention forbids any interference, including interference based on otherwise valid laws, against the procurement of defensive arms by groups which are being victimized by genocide.